Dos d’Ane Pond is a half day hike that is physically demanding but unique. Climbing the mountain usually means becoming wet and muddy, and the final climb is gruesome and awkward. The pond at the top on the other hand is unique and unexpected with a small but picturesque waterfall draining the pond. The rainforest to the top is one of the greenest climbs and gives the strange feeling of being in a different world. 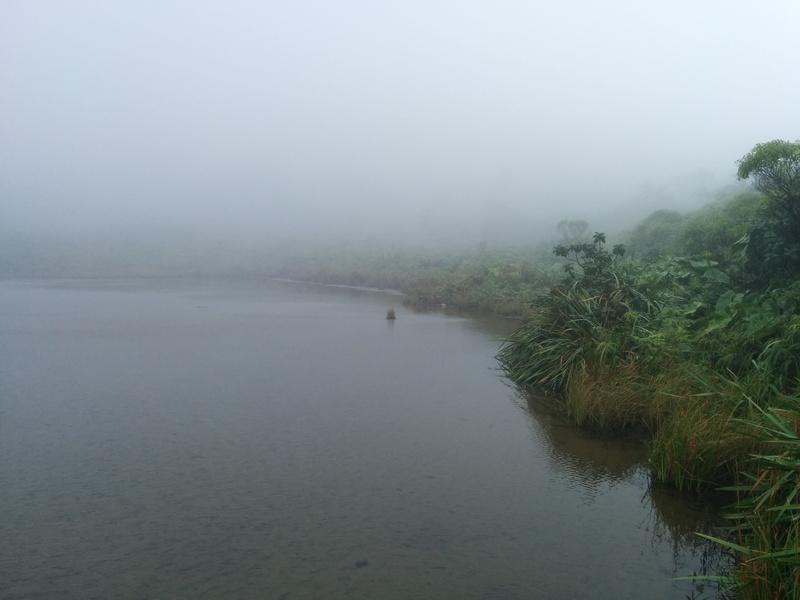 If you are looking for views bring a horseshoe and a rabbit’s foot with you, this hike tends to always have cloud cover at the top, even glimpsing the opposite side of the pond can be difficult. That said in the perfect and once in a blue moon situation the climb could be rewarding and challenging, mixing our two favorite things. The trail itself is easy to find and follow but a strong vehicle with reasonable clearance is needed to get to the trailhead. The trailhead begins at the end of the road to Romney Manor/Caribelle Batik/Ziplining in Middle Island. Head West from Basseterre on Cayon/Old Road until Middle Island just passed Sprat Net Restaurant. Turn right at the signs for Caribelle Batik and Sky Safaris and keep left at Romney Manor, continuing on this road. The road will become rough terrain shortly after the turn off for Caribelle Batik. A vehicle with good clearance and 4 wheel drive is recommended, but may be possible with other cars. Ascend for 3 km from the main road until the road flattens out and opens from the canopy to a small paved clearing at 365 m above sea level. From here continue on the dirt road by foot for 600 m, there will be a fork angling left up to a gated and fenced in area that you will enter and leave the road. The trail follows the fence (keeping it on your right) for about 250 meters, then exits and descends to the left for 50 m until the trailhead, marked by a green post wrapped in pink blazing. There may be a sign for Dos d’Ane Pond at the base of the post. From the start the trail begins to ascend quickly. The trail begins up a short but steep ghaut that shortly after becomes a more gradual switch-back trail, ascending the ridge of the mountain. 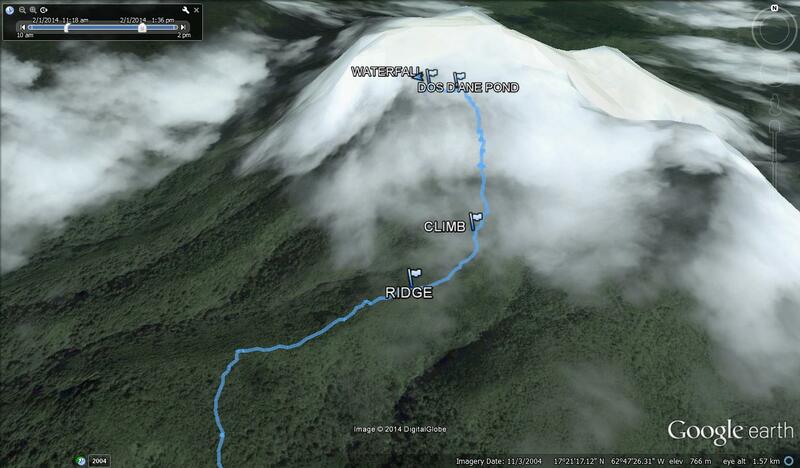 The trail will cross a ridge about 0.5 km in, but then continue back up again. 2-2.5 hours after leaving the parking lot you’ll reach the final ridge at an altitude of 750 m (~2460 ft). Follow the trail by looking for the same pink blazing that was on the post, it marks the trail all the way to the top. This ridge marks the last 200 meters of flat ground before the final climb. Crossing the ridge begins by entering thick brush, the smaller you are the easier it will be, but the ground is almost guaranteed to be wet and muddy, wanting to steal your shoes at every chance. The winding trail on the ridge will eventually open up and begin to ascend again. The final climb becomes a grueling muddy scramble. Using roots and rocks to step up and gain purchase on the mud in important while climbing up the single track gutter that has formed in the clay. The gutter track up the hill is about a foot deep and less across, just wide enough to step heel to toe up the trail. Only 300 meters long but gaining 140 meters, almost a 25 degree incline. Quick warning about taking animals on the trail: this final climb is doable by most fit dogs, but the gutter can trap smaller dogs or risk having them tumble into the gutter and potentially injuring themselves. If bringing your furry friend along consider a carrying harness, and/or porter to carry it to the top. Finish the climb strong and come out at the entrance to Dos d’Ane Pond. The freshwater pond sits at 933m (3061 ft) and is small but is home to small fish and to the left drains into a small waterfall. The base of the waterfall is a good place to stop and have a snack before heading back down. Facing the waterfall from the top, go to the left and follow the short trail down to the base of the falls. To descend, simply go back the way you came. Stop at the pond to wonder what’s on the other side of the fog and enjoy the descent down the gutter. Follow the pink blazes back down to the post, walk to your car and put it into neutral to save fuel on your way back down to the main road and home (or beach) to wash off the mud and clean your new scraps. CLICK HERE TO DOWNLOAD THE GPS TRACK DATA FOR DOS D’ANE POND HIKE OR CHOOSE FROM THE BOX.NET FLASH WIDGET AT THE TOP OF THIS PAGE. I did this climb yesterday 11/18/2015 and the coordinates are spot on. This was very useful. The gutter climb is definitely difficult. Most of this climb can be done by people with little experience. The gutter climb is very difficult and you climb most of it with very little strong footing, coming back down is a task itself as well. Be prepared to slip a lot. The view is amazing once you get to the ridge just before the gutter climb. This is a very good climb and the trail is still marked very well. HIGHLY RECOMMEND this climb. I started about a mile down below the the parking lot because the taxi couldn’t get up the road any closer to the parking lot. I started about 715 and was to the top at 918, then returned to the bottom to the Safari place around 1015 to get a cab back to Frigate Bay where I was staying. I took a bus that is basically public transportation to town and then got a cab back from Bastatere, which was very easy. Don’t stress to much about getting back to your hotel. Find a vehicle with a H on the plate and wave them down. I brought a change of clothes and flip flops so I could clean up. I did this climb about one week ago. The trail is still very visible and easy to locate. Even though there are not a lot of markers on the lower portion, I still had no trouble following the trail. 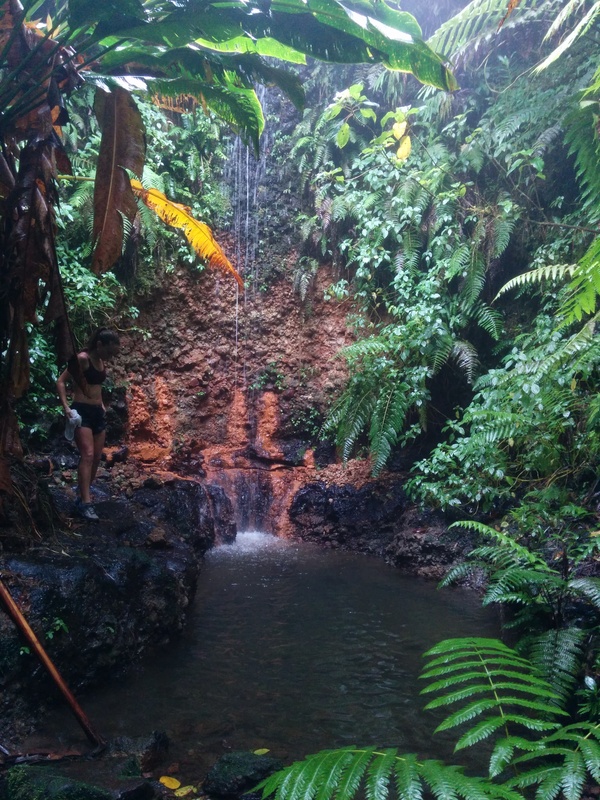 The rain forest is gorgeous! It makes you feel as if you are in a different world. Great work out. I highly recommend this climb. Me and some friends did this hike yesterday (May 2nd, 2017) and we absolutely loved it. The description of the trail above is spot on and the only change I would recommend is change the rating from 3/5 to 5/5 as long as the hiker is aware it will be a challenge and at times, claustrophobic. I recommend to bring a rain coat and perhaps a hoodie or something warm since it gets cold on the summit (in the clouds, wet and muddy). The trail is marked very nicely with faded orange/pink ties in addition to bright pink ties that were put in place by hikers in front of us. When you reach the upper parts of the hike the markings are reduced significantly but there is no where to get lost, just follow the narrow trail and keep going until you reach the lake. Once you reach the lake you will need to walk in the water towards your left for about 75 meters and then the last leg of the trail to the waterfall will be on your left but it is barely detectable so use your sense of hearing (you will hear the waterfall and when you find the top of the waterfall (coming off the lake) , the trail will be to the left. I would not recommend anyone with knee problems, fear of heights, people who don’t want to get wet/muddy, or anyone who doesnt like a challenge to do this hike. be prepared with plenty of food and water and hopefully a 4×4 capable vehicle. We have done the Bat cave/lawyer stephens cave/ volcano rim/ gong beach/ shitten bay/ radio tower/ sofa rock hike but this hike was the best by far in my opinion but I cannot overstate that you will be in for a challenge. Have a great day. Did this hike yesterday; July 2, 2017. It was fabulous, but hard. Heavy rain hit St. Kitts on the 29th and 30th, so the mud was boot-sucking for a good portion of the trail. The friend that hiked with us does the trail annually and said that the rain had washed out a lot of the track. It most places it was wide enough for one foot, but knee deep, not a foot deep. It was cool and wet the whole way. We each carried two or three water bottles, would recommend at least four, or a camelback. Pond was too full and cloud cover too thick to walk around to the waterfall, but that’s ok, we had a blast. Hikers in our group were 21, 47, 54 and 58 years old. I think I’m in pretty good shape for 54, run 6-8 miles daily, but could have used some more upper body strength for this climb. Because, in some places, it is much more a climb than a hike. Take your time, don’t rush and you’ll do fine. But bad knees will do you in on the descent. We did this hike on the 25th of November 2017. 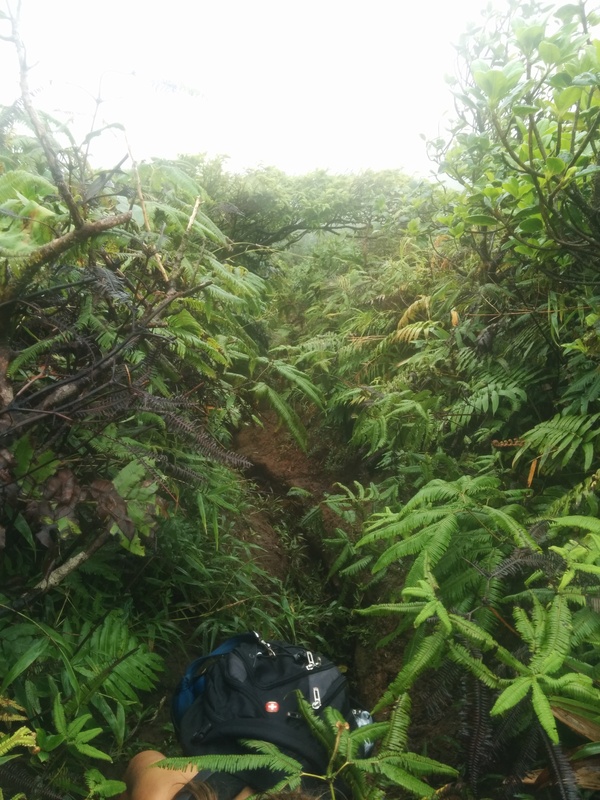 The trail was rough due to the hurricanes that recently hit the islands, but it was doable. Take your time, don’t rush, and enjoy the pond and waterfall. One love. Hello fellow hikers! I just went up and did the trail this morning (Jan 14, 2018), and with all the rain and post hurricane, the beginning of the trail is actually impossible to see – I have done the track before many years ago and had trouble finding the trail-head with all the over growth. Otherwise I had a wonderful hike, but anyone heading out in the next month be aware of the fallen tree branches that have not been picked up after the many storms we have had. I also STRONGLY recommend hiking boots – sneakers will just get sucked off from mud. I live and work here on St Kitts, and if anyone visiting would like someone to take them up this track without paying a guide i’d be happy to show the way. I am available on weekends, email edemmons@rx-gen.com!